There are 3.5 billion searches on Google every day. That’s 40,000 searches every second, roughly 105 billion a month or a whopping 1.2 trillion per year. That’s a whole lot of search volume. Optimizing your website to capture even a fraction of that traffic has been, and continues to be, an immense undertaking for any website. Understanding how search engines interact with your landing pages is an essential part of search engine optimization (SEO) efforts. Likewise, keyword research continues to be the bedrock on which serious SEO efforts are built upon. Understanding your keywords means being familiar with your audience, the types of questions they might ask and the services you hope to provide on each landing page. For most websites, this means finding the more specific, narrowly focused topics or questions that are being searched for within a targeted industry. A large part of any digital marketer’s job is finding and understanding the keywords that will be most important to the client’s webpage. This does not mean simply finding keywords with a lot of volume, or keywords the competition might not be targeting. Understanding the implied level of engagement and intent behind a keyword can be just as important as the number of searches it receives each month. Look at your keywords from the searcher’s perspective. What does someone searching the term “hunting” want to see in the results? They might be looking for great public hunting lands near them or for information on getting a hunting license. Perhaps they’re looking for articles on how to be a better hunter or statistics on how hunting affects the environment. Understanding search behavior and intent is a huge part of any marketing effort. 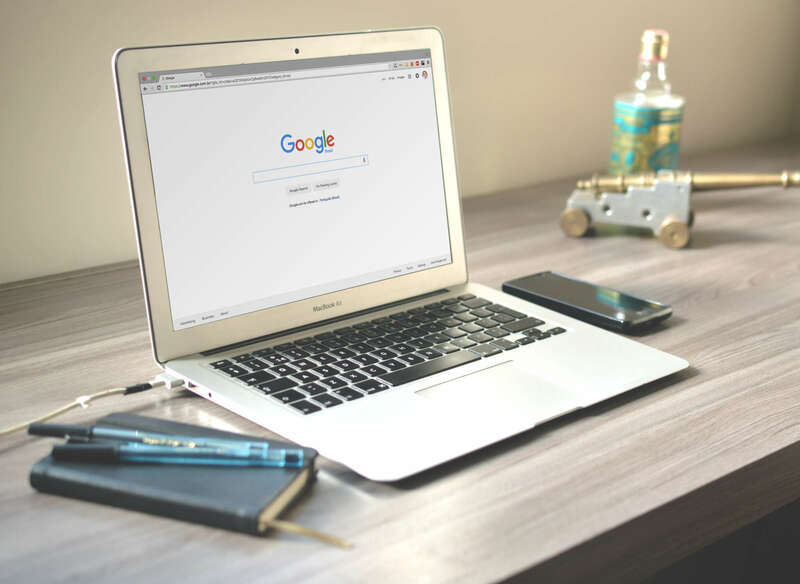 Research such as the work done by Spyfu on search behavior has tried to identify how users are approaching searches and interacting with Google. Google constantly adapts and evolves their search algorithm to help better understand the intent behind searches. Differing word choices or phrases used by a searcher give Google (and by extension, us) a better understanding of where they are in their search, along with what kind of information we should provide them. While “hunting” might be a keyword with tons of volume, it is difficult to determine the intent behind those searching it. Conversely, a search for “bowhunting tips” is simple to parse, and a page can be easily crafted around it. Next, we have to determine our desired search intent, which is a term used to describe the type of information a searcher is expecting to see when they type their query into Google. In their latest whitepaper, STAT explains each type of search intent and how Google interacts with them. Let’s look at a query that would fall into informational intent. Informational intent implies our searcher has identified a specific problem or desire and they are actively searching for a solution. 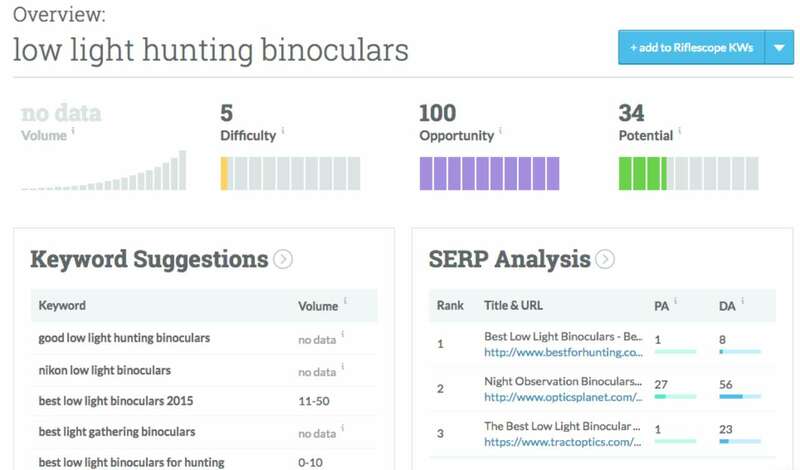 So, what solution could someone searching for “hunting binoculars” be looking for? This comes down to understanding the targeted audience. No SEO tool on the market is going to help you understand the mind of your audience. That still requires at least some familiarity with the material at hand and the market you’re working in. Read and search relevant forums. Listen to existing customers by asking questions on social media and other platforms. Anything you can do to understand the consumer, find exactly what they are interested in, and identify the challenges they encounter will help lead you to the solution. Sure, we can use the plethora of tools online for keyword suggestions. They are all useful, but you won’t gather the full picture until you ask the same questions as your intended audience. Alright, we have our core subject, a good idea on the actual question we’d like to answer and a rough knowledge on what our keyword might be. It’s time for us to get into the weeds a bit and find out actual volumes. While “best low-light binoculars” might sound like a good subject to us, there is no way to tell if people are actually searching for it without doing a bit of digital snooping. Fortunately for us, there are quite a few tools to help us out. The most widely known research tool in the industry, this one will probably be the bread and butter of any digital marketer for the foreseeable future. Despite Google restricting more and more data and combining some volumes in keyword planner, this is still probably your best bet for starting out. Keyword Explorer is geared towards search engine optimization rather than search engine marketing. This means that the types of data are going to be more focused on helping you rank organically, as opposed to giving you information on adword bidding amounts or other paid marketing analytics. Keyword Explorer will display what type of competition you’ll face in the search results. Its volume measurements can be spotty at times for lower volume or long tail keywords, but it’s well worth the money if you can afford it. Moz does a pretty good job at comparing Keyword Explorer to Keyword Planner, though in reality you’ll most likely want to use both. While the data Moz can provide on keywords is considerable, volumes for longtail keywords can be unreliable. Make sure your checking through multiple sources when compiling your research. Ubersuggest is a nice, free source for getting new ideas on keywords. It works best as a tool to find long tail keywords if you are having trouble narrowing down a topic. Keyword data from Ubersuggest can be limited, so you’ll definitely want to pair it with Explorer or Planner to get the bigger picture on its results. Another alternative to Keyword Planner, SERPs Keyword Research Tool has less ability to customize your queries when compared to Keyword Planner. It’s more focused on SEM than SEO. Still, it’s a good place to start if you’re looking for a free alternative. Any digital marketer is familiar with SEMRush and its suite of tools. The keyword analytics provides a Phrase Match tool with a trove of search terms that SEMrush correlates with the original keyword you provide. The Phrase Match tool works similarly to ubersuggest, with more of a focus on long tail search terms that contain the targeted keyword. While there are ways to get more localized volumes, SEMRush isn’t always the most user-friendly to navigate, so the full breadth of features might not be apparent at first. A bit different than the other tools, Answer The Public works similar to Google Auto Fill. Enter a keyword to see what questions people are asking Google about it. You won’t get any volumes with this tool, nor the sorts of competitive data that Moz provides, but it is a nice way to break up any mental blocks arising during your search. Back in the infancy of search engines and algorithms it was understood that keyword density was king. Shotgunning a keyword into as many places on the page as you could was the be-all and end-all for rankings. Websites were cluttered with clunky, hard-to-read and hard-to-interpret copy as a result. This practice is now referred to as “black hat SEO.” Luckily, we’ve moved on quite a bit since then. So, let's summarize what we now know: Volume matters a whole lot less and content matters a whole lot more. With the introduction of Google’s RankBrain keyword targeting has changed quite a bit. The relationship between words now matters, and words that seem interchangeable to us should be understood by Google in the same manner. Let’s look at an example, in order to understand what RankBrain is bringing to the table and what Moz is explaining in the above blog. 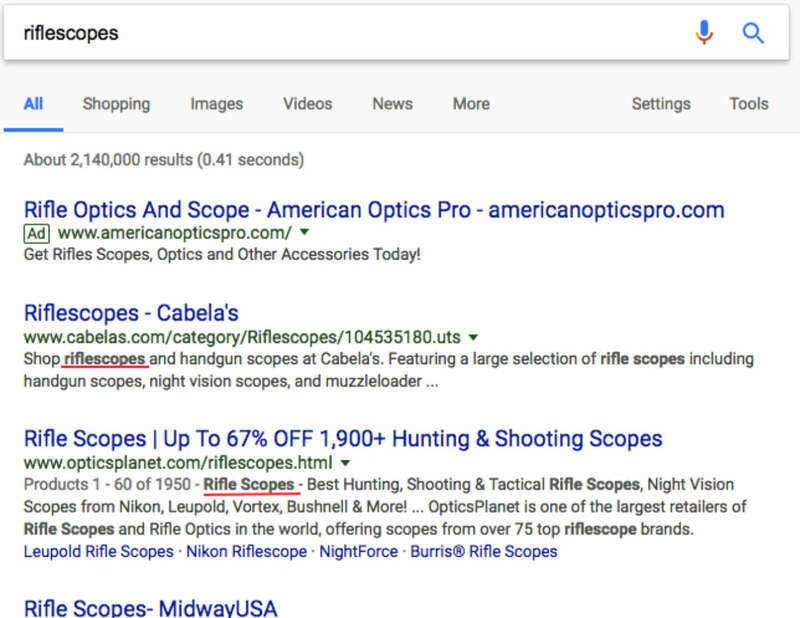 If we were to search “rifle scope,” you’ll notice that both “riflescope” and “rifle scope” are being highlighted by Google. Despite these being “different” keywords, Google now understands them as interchangeable terms. Same for “UK” and “United Kingdom,” “feral boar” and “wild hog’” and thousands of others. With RankBrain, the emphasis to use the exact wording of our keyword need not be as greatly emphasised for SEO best practice. Notice that both keywords are highlighted in the meta description by google. So what does that mean for a client’s web page? Content trumps gimmicks, so making a client’s page factual, relevant and easy to read should take priority over keyword density. Ultimately, the goal of all of this is to bring the desired audience to the client’s website. There are plenty of tools out there to gauge success and tweak the page as necessary in order to capture your slice of the search volume pie. Having Google Analytics set up properly should allow you to see what kind of organic search volume you are capturing to the website.